A guide to 34 natural places around Ballarat. 44 pages including 8 pages of coloured photographs and double page map. 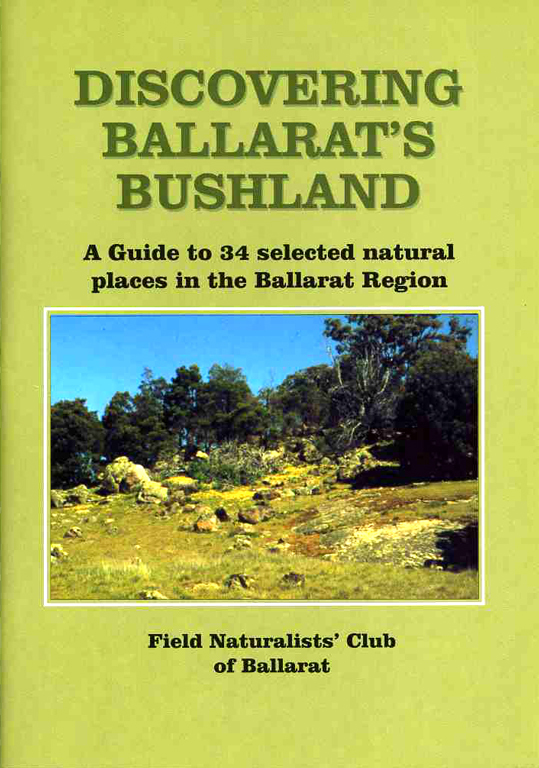 The book describes the location, facilities, flora, fauna, geology and historical information about publicly accessible bushland within 50 km of Ballarat. Useful for people looking for localities to visit in Ballarat’s vicinity for nature study, bird observation, bushwalking and picnics. 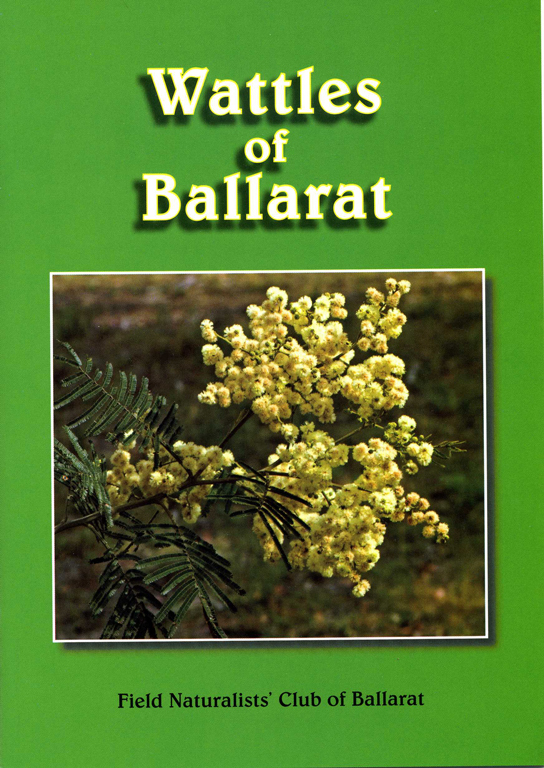 Book of 32 pages includes text and photography on twenty-one wattles occurring naturally within 40 km of Ballarat and three wattles which have been introduced and spread into local bushland. The text on each species covers the habit, foliage, flowers and distribution of each wattle in the area. Two photographs for each wattle show a close-up shot of flowers and foliage and another shot showing the whole plant in its habitat. There is a key to identify the wattles of the Ballarat area and general information about wattles. I have two subjects of inquiry. One, how do I go about purchasing your two publications? And two, What books, in your opinion, cover the Ballarat-Creswick areas plant species most comprehensively? Or alternatively if there aren’t any, how do I go about finding which endemic plants to the Ballarat-Creswick area are endangered locally or nationally? I am interested in such knowledge, because I am particularly annoyed at the destruction of biodiversity that has occurred with the clear-felling of decades old pine forest on Brackenbury Hill, Creswick. I would like to identify as many native plants as I can before they are destroyed and lost. From what I can witness, is that a diverse understory of native plants have clung onto existence, by populating undisturbed pine forest and have generated food and homes for native fauna. I see current forestry practice (certified sustainable), destroying all native populations. I think the importance of these native plants, is that they show what was existing pre-settlement and mining days, when so much has been lost in this area. An example is the Victorian Christmas Bush (prostanthera lasianthos), which only seems to have one miniscule isolated population locally. Typically they need certain moisture and tree cover. This population has recently been literally slashed by track maintenance machinery, without any regard to its vulnerability locally. I find different native plant species preferring to position themselves either within a certain pine forest or along the roadsides of a certain pine forest, that do not occur in designated ‘natural native’ areas, like the neighbouring coppiced gum-tree woodland. Duncan if no one has replied to your query, please let me know by commenting here again, and I will get back to you. I am concerned about abuse of our public forests (and plantation areas) too.